The story of one bird's quest for cool black headgear. Review: OK so just to get this out of the way, first I’m going to start this review the same way I start all of my reviews about Harvest Rain’s productions. I know these guys. They are friends of mine. If I didn’t like the show I would not be objective about it. I would still tell you I loved it & just go to hell for lying before I ever gave them a bad review. Better yet, I just wouldn’t write a review! In short, you can’t trust my opinion but it’s so late in the season it’s not like you really would have anyway. Let’s start out with the things I didn’t like about this show. There was only really one thing I didn’t like but in some people’s opinions it is a fairly big thing. I didn’t like the musical… at all… I just don’t like JC Super Ted. I think it is massively overrated & as a story, stinks. I know that sounds horribly blasphemous of me but let’s look at it critically. I’m not trying to say the actual bible story of Jesus is poor. It’s lasted 2000 years so far & people are still writing songs & making movies about it so it has to have at least a few engaging elements. I’m saying the story put forward in JC Supermarket is average. I’m saying if you didn’t know about the story of Jesus then it would make no sense at all. I’m saying if the bible had never existed & this was just a musical story written by some guy rather than a musical story ripped off by some guy it would be completely pointless but most of all, I’m saying Tim O’Conner is the musical theatre equivalent of Sir David Attenborough. He can make the most pointless, boring, cow pat of a subject absolutely enthralling & that’s what he’s done here. The simple fact of the matter is that everybody does, at least loosely, know the story of Jesus so trying to make this plot stand on it’s own two feet is not a challenge you have to overcome. It’s overcome for you. The real challenge is making the music entertaining & this has been done by way of the amazingly talented Maitlohn Drew. The arrangements & presentation of the songs in this production are fresh & imaginative. The obvious standout was Mary’s solo I Don’t Know How To Love Him. A song that has been done to death by everyone under the sun was given a completely new lease on life thanks, in no small part, to Naomi Truloff, who’s characterisations are always amazing to watch. The lighting, sound, epic set (I mean seriously epic) & ensemble cast were fantastic. I remember thinking how meticulously the show had been choreographed however, speaking with Tim after the show he said it wasn’t choreography but the cast had just really owned their roles & taken it upon themselves to put 110% into every scene & it really makes a difference. Nobody appeared to be slacking or tiring. No matter how hard I looked (because I was trying to find something to fault these guys on) everybody was completely devoted to the character they were playing. It was brilliant! 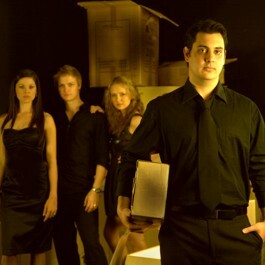 The show started out with the breath-taking vocals of Tod Strike who had, by far, the hardest role in the show; Judas. Yes, Jesus is a very challenging role too but Judas starts up & stays up & when he is backed by the awesome ensemble cast it made for some magical theatre. Well, that’s it… that’s my whole review… what? Oh fine. I guess I have to say something about the guy that played Jesus but I’m not happy about it. Having performed with Luke Kennedy I’ve seen how much good press this guy gets & the thing that really gets up my nose is that he deserves it! In every way! I hate to add fuel to the fire but he can sing, he can act & he is a nice guy. In short, I hate his talented, friendly, better-looking-than-me guts. Hey Kennedy! If you’re reading this I’ve got an idea for you. I want you to go out, rent a copy of Who Framed Roger Rabbit & take it to a public toilet. I don’t mind which one but the dirtier the better. Start it playing (you make need to do this on a laptop or something. You’re a smart cookie, you’ll figure it out.) & when it gets up to the part where Christopher Lloyd starts laughing with those “burnin’ red eyes & that high squeaky voice” just dunk you’re head in a bowl, flail your arms around & pretend it’s me howling in the background with delight. Rinse & repeat. Seriously though, I’m just jealous. Luke Kennedy is flawless in his portrayal of Jesus. I know praise of this guy is so common these days it almost feels like a band wagon I have to jump on but there is a reason for that. He’s fantastic. His rendition of Gethsemane is the greatest I have ever heard. I don’t mean the greatest I have heard live or in Brisbane, I mean ever, anywhere, in any medium & I’ve even heard LUKE KENNEDY sing it before! The final knife in my side was at the end of the evening when my partner looked towards Luke’s lovely wife & say “Aww… she gets to go home with Luke KENNEDY.” I’m not even kidding. He was that good. Anyway, it’s now 3PM & the final show goes on stage at 6:30PM so if you haven’t already got tickets then you had better hurry. The season all but sold out anyway & so it should have. This show is everything Brisbane theatre needs & deserves the great success it has enjoyed. I just have one final thing to complain about. The lady sitting in front of me. Did you enjoy the show? Me too. Did you know they now have an invention called a hair straighteners? You should use one or some bobby pins or a large bucket of water or anything that would keep your massive, Fran Fine-esq hair do from blocking the view of half of the theatre. I thought I’d gotten turned around when heading to the show & ended up in a Flock Of Seagulls reunion. Seriously, you made Effie look like Angry Anderson. Any time someone moved to the middle of the stage it looked like they were walking on a cloud of your hair. At what point of the night’s preparations did you turn to the mirror & say “I know what look I’ll go for. Recently electrocuted!”? Next time you’re coming to the theatre please give me a call & we’ll organise to go together. That way you can sit next to or behind me. Did you see the show? If so I’d love to hear your impressions. If not… suffer in your jocks. Executive Summary: HOLY FREAKING UNICORN DROPPINGS!!! Sorry to complain so much but I had to say it otherwise I’ll never be taken seriously as a reviewer. Now, on to the good stuff. SHE WAS SO FREAKING AWESOME!!!!!! I don’t mean the “Hey, I won $250 on a scratchy. Freaking awesome!” level of freaking awesome. I mean the “Chuck Norris & Christopher Walken walked into my living room & started playing Stairway to Heaven just as Wolverine finished baking me sugar cookies.” kind of awesome. She seriously blew my mind. The Powerhouse was the perfect venue for the evening’s entertainment. If you’ve been there then you know it’s distinct, graffiti look & feel. Combine that with some very simple, dusty lighting & it was almost like sitting in a jazz bar somewhere in down town New York which suited her style perfectly. The great thing about the Powerhouse is that it only seats about 500 so every seat is a great seat. I was somewhere around the middle of the audience but I think the only way my seat could have been any better was if they had placed a La-Z-Boy on stage at the feet of her amazing accompanist James Sampliner & let me watch her from there. I do think this is a concert that needs to be seen up close & personal at least once however. Don’t get me wrong, Shoshana Bean is a true performer. If she was performing to a packed 15 000 seat theatre I have no doubt every person in the back row would have gotten a great show but being as close as I was meant I could see all of the little things she did as well. Especially for the quieter numbers. It just added an extra layer of enjoyment & if Shrek taught us anything, it’s that layers are important. In all honesty I do not know how she does the things she does with her voice. She can go from absolutely belting her hair off to the most beautiful, gentle rendition of My Funny Valentine in a heart beat seemingly without any effort at all. 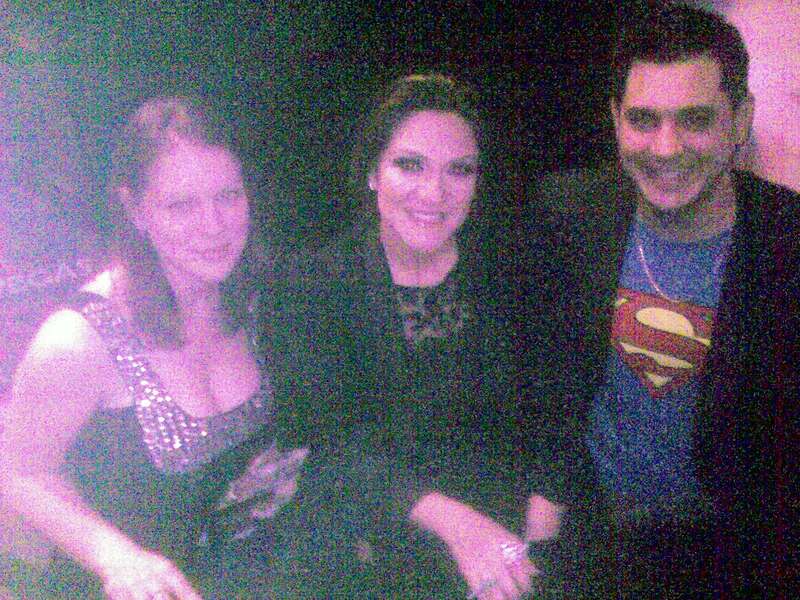 Finally, perhaps my favourite part of the night & something that I thought really showed off what an awesome woman she truly is, Shoshana Bean stuck around to sign autographs. I am possibly the only straight man to own one of these. I know a lot of you might be thinking “she only did that so people would buy her CDs to get them signed” but you would be wrong. While speaking with Harvest Rain‘s CEO, Tim O’Conner (i.e. the guy who brought Shoshana Bean to Australia) I learned that Shoshana didn’t think she would have anything like the following she does here so she only brought 50 CDs with her for her whole tour. They were sold in about half a second. (I managed to get one but only because I was willing to punch out an old lady & ride off on my horse.) She must have signed at least 300 autographs on little Shoshana Bean cards she handed out for free. Plus she posed for a photo with me so if you say anything nasty about her I’ll punch you. Yes, she did say she liked my shirt. In conclusion, this was a fantastic night. The best thing about seeing stars like Shoshana Bean is that she brings out the real music theatre buffs so you know everybody was just as excited to be there as I was. She now moves on to Adelaide & Sydney so if you happen to be in the area don’t miss this show. Details can be found on www.eventful.com so check them out. Did you see the concert? Let everyone what you think in the comments section below. Hello once again ladies & gentle persons of indiscriminate gender. Welcome to another bout of pointless rambling from yours truly. 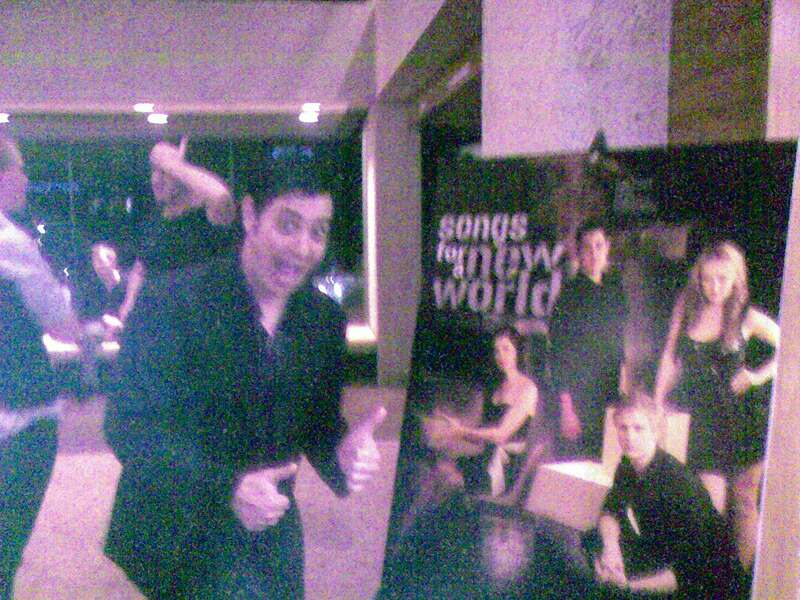 I must admit that I am writing today’s blog with a slightly heavy heart for today marks one week since the closing of Songs For A New World. Since that time I’ve been able to kick off my shoes, replace them with my Superman thongs (yes I really own a pair) & get back into the groove of my life pre-Harvest Rain but before I can completely say goodbye I need to done one final thing. I am a Nigerian general who has recently inherited $6 000 000 after the death of my darling mother. If you would like me to give it all to you for no suspicious reason at all please be at the Harvest Rain warehouse on Mina Parade this weekend so we can meet. I had a sneaking suspicion he was using a fake name but who cares. Six million dollars is a lot of money. Sadly he never showed but by an amazing stroke of luck Harvest Rain were auditioning for Songs! What are the odds? By an even more amazing stroke of luck I got cast as Man 2 & the whole journey kicked off. The People: Before I ever work with anybody I have this nasty little habit of researching them to see what they’re like. If I’m being honest a lot of people said a few not so nice things about Harvest Rain. Not about anyone in particular, there are just some rumours going around about the group in general. I heard one rumour that said they employ lots of gay people & try to keep them straight & then another one that said they refuse to hire anyone who isn’t a heterosexual. Let me tell you that if EITHER of these stories are true then Harvest Rain is really not living up to people’s expectations. There is a more diverse cross-section of people in their employment than at a Pauline Hanson protest rally & nobody is concerned at all! DISCRIMINATION FAIL!!!! They had gay people working with straight, short people working with tall & even skinny people working with me! It was like a real life version of that musical episode of Different Strokes I always wished they made. The most common story, by far, & the one I think I take the most exception to, is the rumour that Harvest Rain are cliquey. (Cliquey – adj. – kl ee kee. 1. An exclusive group of friends or associates who don’t let you play with them because you’re nerdy or you like comic books or you write your own blog, even though the only reason they don’t do it is because they are big stupid heads… Sorry, where was I?) If you are reading this & think “Oh NOES! I told Luke they are cliquey!” then don’t worry, lots of people did. Nobody said it out of malice, people actually believe it but this is one rumour I have to put to bed now. There is a big difference between a clique & a family. The term clique is usually used to describe a group of people who exclude others & I am living proof that these guys don’t do that. I was welcomed into their family with open arms & invited to dinner & taken out to try my first sushi & never once was I made to feel unwelcome. If they were cliquey people, why would they do that? I doubt they were trying to impress me. I am a complete nobody in the theatre world but these guys made me feel like I was part of something special so for that I say “thank you”. P.S. They are so totally a cult though. They sacrifice interns to the pagan god Dumbledore every winter solstice in the hope that he will convince the Sorting Hat to give them a bountiful Horcrux… or something like that. I could never keep up. My Final Thought: Did you ever do something in your life that was so perfect you were almost (please note the use of the word almost) glad it ended simply because it meant you could no longer mess it up? Well that’s how I would describe my Songs experience. I really feel I met some amazing people & together we made some amazing theatre & now it is crystallised as a perfect memory that can never be taken away from me. I know the audiences were small but I think that made them even more special. Kind of like Collector’s Edition People. Especially the ones who were so moved by the show that they came to see it two & three times or sent us emails or came up & shook our hands in the foyer afterwards. It really was so fulfilling that by the time it came to an end I didn’t feel as sad as you might expect. I now simply look forward to the next time I get to work with Harvest Rain again… even the gay people. Executive Summary: Sometimes the only thing you can say is “Thank you”. Review: To begin with I’d once again like to lay everything out on the line honestly. The makers & some of the stars of this show are my friends so, naturally, there is a chance I’m going to have a bias. If you have a problem with this fact then I’m going to need you to build a bridge & go jump. If you are able to put that aside then let’s begin. It was not going to be funny. Seriously, as morose as it sounds, Michael Kooman & Christopher Dimond have managed to write a musical that delves into the horrific issue of childhood leukemia yet still keep it light-hearted enough so you don’t feel like slitting your wrists halfway through the first song. You continually find yourself fighting back tears just seconds after laughing your head off. Not all of the credit for this can go to the writers. The cast does a wonderful job of delivering this work. The four stars (& I use the term very deliberately) Juanita Ellis-Gloster, Heidi Enchelmaier, Shaun Kohlman & Tyson Stuetz are all part of Harvest Rain’s intern program (at least I think they all are. I did less research on that fact than I do on most of my “facts”.) &, if I’m being completely honest, do lack a little in stage experience. This is not to say they aren’t far advanced over many others of a similar age & with similar amounts of stage time under their belts, because they are. The only real reason I mention their lack of experience is because of the positives it brings. All of them are completely fearless on stage. Many of the character choices they made could have gone really wrong if they were made by someone with just a little more experience who would have played things a little more safely. In order for 18 year olds to convince the audience they are 9 they have to be as fearless &, well, inexperienced on stage as a 9 year old is in life. This means that, in general, something that would normally be considered a weakness kind of works as a strength. Before even stepping into the theatre tonight I was pretty sure this was going to be a bit of a tear jerker, or at least it was intended to be. Just because something is intended to be sad doesn’t necessarily mean it is going to pluck the required heart-strings. I really wasn’t sure if they were going to be able to pull it off but the second Enchelmaier sang her first notes I felt a lump rising in my throat. I was amazed at how instantly I believed she was a child. Exactly the same compliment can be made of Kohlman. These two fill the stage with a beautiful chemistry that really provides a fantastic foundation on which the show builds itself. Special mention must be made of Kohlman’s rendition of Why I Love The Movies. Perhaps it’s just because I would love to sing the song myself but it simply tore my heart out. Stuetz is hilarious as Raph. He posses the amazing ability to look like an English butler when standing with the added bonus of being able to morph into an earthworm when needed. His versatility is a real asset to the show & many of his laughs stemed not from his script but from his portrayal & for this he should be applauded. Ellis-Gloster performed admirably in what I think is the hardest role of the show, the mother. Amidst all the craziness & immaturity of the other characters she has to remind us that what we are seeing does have a realistic side. She also has the un-enviable job of having to walk the fine line between being constantly worried without becoming whiny & annoying. Her solo towards the end of the show was also one of the highlights. Finally, a hearty congratulations has to go to debutant director Carmen Glanville & her production team. Her direction shows wisdom beyond her years. I loved basically everything about her vision for Dani Girl. It was heartfelt, honest & raw. In short, everything it needed to be. The set design was beautiful in its simplicity & whoever did the lighting design needs an award. It was really clever & made you complete forget you were sitting in shed. I hope everyone goes along to see this show while it is still showing as these guys deserve packed houses. Feel free to leave comments if you do. It occurs to me that many of you may not know exactly what The Divas are. I think the only way I can put it is to say they are the brain child of someone who was beaten around the head by an elephant. The idea is insane. Five girls playing massively over the top divas who think they are God’s gift to… well, everything & everyone. Including God. How can anyone make this work? Five characters, which are essentially the same, constantly fighting & bickering & trying to outdo one another? Surely the show would eventually descend into chaos, disorder & long stretches of pointless, poorly ad libbed dialogue. Having said that, maybe my executive summary didn’t really give a truly accurate description of my feelings towards the evening’s entertainment. To put it another way, LOOOOOOOOOOOOOOOOOOL!!!!!! Seriously, I laughed so hard I think I sprained a lung. It was funnier than that video of the kid getting kicked in the head with the soccer ball. You know the one. If I’m truly being honest I wasn’t expecting to enjoy the show as much as I did. (Sorry guys.) I had seen some of the YouTube videos & while they made me chuckle, it really didn’t seem like a concept that could fill a two-hour show. I knew I would love the singing because I have heard all of these women sing before but I was pretty certain I would want to stab out my ears whenever they made jokes. I was so wrong & I’m not just saying that because they had a picture of me in the foyer. I can't decide who's cuter, me or... me. Yes, there were lots of jokes where they singers were declaring how lucky the audience was to be seeing them or stealing the lime light from one another but it never once got too much. They managed to balance it perfectly with some very touching moments. I really was absolutely stunned because it couldn’t have been easy. The singing was every bit as brilliant as expected. These girls blend so well & while the comedy in the show was quite slapstick they all obviously take their music very seriously. A lot of work had gone into the songs which were beautifully arranged by the amazing Maitlohn Drew. I guess it would be fair to say that a lot of work has gone into all aspects of the show. The way it sounded, the way it felt & of course the way it looked. 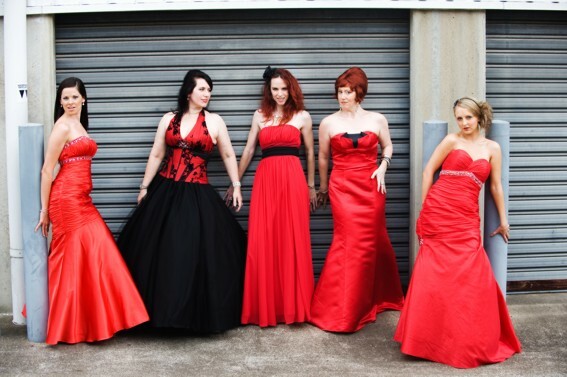 My better half spent the entire evening complaining about how she wanted every dress that was paraded onto the QPAC Concert Hall stage & I have to say that these ladies are definitely as easy on the eyes as they are on the ears. At one point, one of the girls (not saying which one) entered from the wings & was greeted with a very prompt & not so subtle “PHWOAR!” from yours truly. My expression was greeted with a very stern look from my date. Lastly, I have to mention the wonderful charity with which this group has aligned themselves. The Divas have formed a partnership with She Rescue Home (<- Click here to show them love) in Cambodia. This a group that fights for one of the worthiest causes I have ever heard of. An estimated 45% of young girls in Cambodia are forced into prostitution or human trafficking. That’s a statistic that made me fall out of my chair & those chairs at QPAC are quite secure so falling out is no easy task. She Rescue Home is fighting to change this (the statistic, not the chairs) & The Divas donate proceeds from their concerts to the cause. I really hope they made a packet tonight because I don’t think anyone can imagine the horror to which these young children are subjected & in today’s world such cruelty cannot be tolerated. So in summary this was the best night of theatre I’ve had for some time. Good singing, good laughs, good lookers & all for a good cause. The Divas have another concert coming up soon which will also benefit She Rescue Home so I encourage everyone to jump online & head over to www.thedivas.com.au & await further instruction. I strongly suggest you see these girls before you (or they) die. You’ll be glad you did. Did you see the show? Did you wish you saw the show? Have you been robbed by one of the members of The Divas? We’d love to hear about it. Leave a comment in the comment section.